Houston, C. Stuart. "Owl". The Canadian Encyclopedia, 18 May 2018, Historica Canada. https://www.thecanadianencyclopedia.ca/en/article/owl. Accessed 24 April 2019. The owl (order Strigiformes) is an efficient, carnivorous, nocturnal bird of prey. 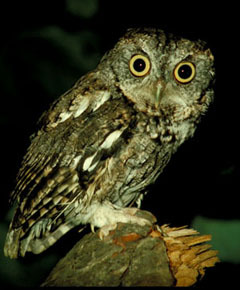 The screech owl does not actually screech, but gives a low whistle that descends rapidly towards the end (Corel Professional Photos). 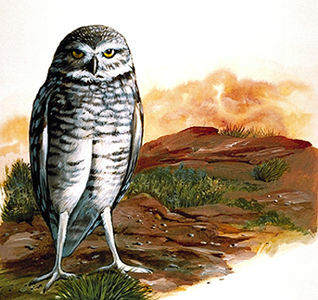 Burrowing owls nest in burrows abandoned by badgers or squirrels (artwork by Jan Sovak, 1989). Great horned owl numbers rise and fall with the 10-year cycle of its favourite prey, the snowshoe hare (photo by Brian M. Wolitski). The barn owl is the only member of the family Tylonidae in Canada. 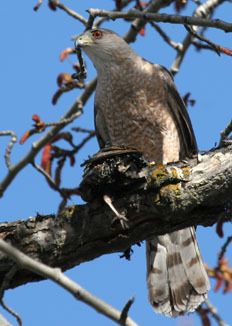 The 15 other Canadian species are of the family Strigidae (Corel Professional Photos). The snowy owl is one of the few species of owls that are active during the day (photo by Tim Fitzharris). 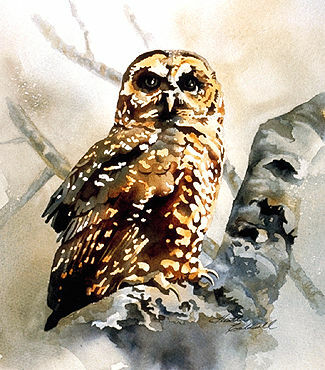 The extreme SW corner of mainland BC is the most northerly range of the rare spotted owl (artwork by Heather Caldwell). The owl (order Strigiformes) is an efficient, carnivorous, nocturnal bird of prey. 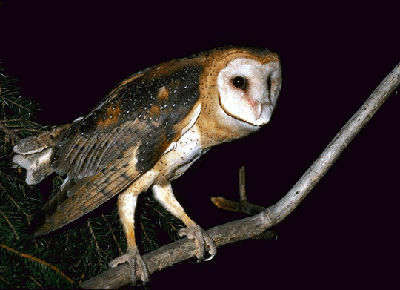 Owls' eerie hoots and calls at night often make them seem mysterious - even birds of ill-omen. Sixteen of the world's 146 species reside in Canada. In most species, the substantially smaller adult male feeds the female incubating the nest. 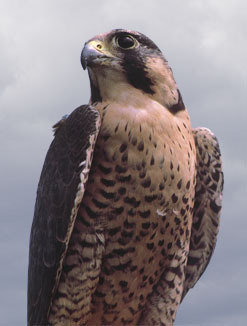 Incubation begins as each egg is laid and there is often an interval of 2 or more days between eggs. Because it can take food away from younger nestlings, the oldest owlet is well fed even when prey populations are low. With severe famine, the parent owl may feed the smaller owlets to the larger nestmates. Owls are downy at hatching and most species remain in or near the nest until able to fly. No owl builds its own nest. Canada's best-known owl, the great horned (Bubo virginianus), usually appropriates the discarded nest of a red-tailed hawk. Great horned owls will also use an artificial platform or even a ledge in a barn. The latter is the usual nesting place of the barn owl (Tyto alba), a species restricted to southern parts of Ontario and BC. The large, reclusive great gray owl (Strix nebulosa) of the Boreal Forest prefers a northern goshawk nest in a larch swamp. The crow-sized, long-eared owl (Asio otus) takes over nests of the common crow or black-billed magpie. The short-eared owl (A. flammeus), present transcontinentally, and the snowy owl (Nyctea scandiaca), restricted in summer to the arctic tundra, both nest on the ground. The burrowing owl (Speotyto cunicularia) of the western provinces occupies badger holes underground. The barred owl (Strix varia) of the southern boreal forest fringe prefers a broken-off, balsam poplar trunk, and the rare spotted owl (S. occidentalis) of southern BC uses a large tree cavity or cliff crevice. Smaller owls, such as the northern saw-whet owl (Aegolius acadicus) and eastern and western screech owls (Otus asio and O. kennicottii) of the deciduous woods of southern Canada, the northern pygmy (Glaucidium gnoma) and flammulated owls (O. flammeolus) of BC, and the boreal (A. funereus) and northern hawk owls (Surnia ulula) of the boreal forest, all nest in woodpeckers' holes in hollow trees. Owls are generally beneficial. Great gray, long-eared, short-eared, boreal and saw-whet owls eat substantial numbers of mice. Great horned owl numbers rise and fall with the 10-year cycle of its favourite prey, the snowshoe hare. 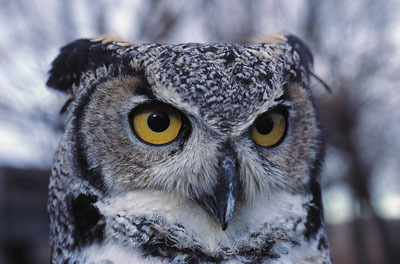 Great horned owls also take Norway rats, American coots and pocket gophers. Rarely, a young great horned owl learns about poultry and visits a farmyard nightly. Regurgitated, well-formed pellets or casts, containing undigested bones and fur, show what owls have been eating. Two of Canada's largest owls, the great gray and great horned owls, are year-round residents, as are the barred, northern hawk, both screech species, boreal and northern saw-whet owls. Current research has found that the northern saw-whet owl is infinitely more common than previously suspected. Most individuals migrate south in winter from eastern Canada into the northern states, but in western Canada the migratory pattern is predominantly from west to east. When hares are scarce in Saskatchewan and Alberta, great horned owls often move as far as 1500 km southeast. 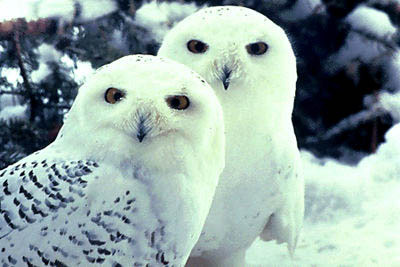 The snowy owl, Canada's third-largest owl, visits southern Canada in winter, and some of the northern owls sometimes undergo large, eruptive flights to the south. Burrowing OwlInformation about the natural history of the burrowing owl. 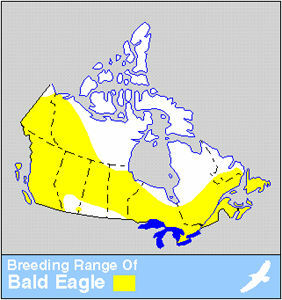 From Environment Canada.